PHOENIX – Momentum is critical to continued success. 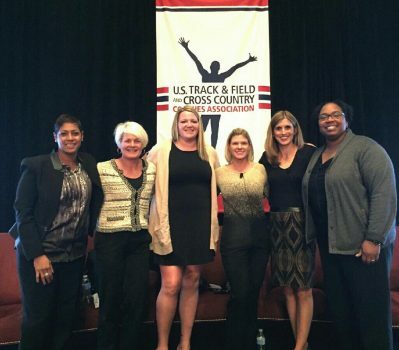 That’s why the “Women in Coaching Event” has grown every year it has been held at the USTFCCCA Convention. This year was the sixth installment of the expanding event, which gives female coaches a platform to discuss important issues they face in the coaching profession. 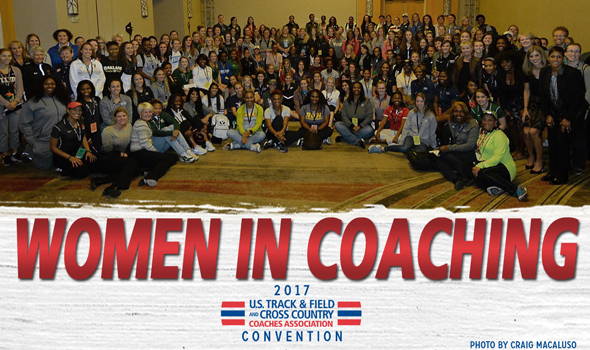 Female convention-goers heard from an incredible assortment of panelists, which included 2017 USTFCCCA Coaches Hall of Fame inductee Amy Deem from the University of Miami, Southern California’s Caryl Smith Gilbert, Grand Canyon’s Sara Slattery, Makiba Batten of Wayne State, Jacksonville University’s Bambi Brundage and Riley. Members of the panel pose for a picture after the event. From left to right: Caryl Smith Gilbert, Amy Deem, Bambi Brundage, Rhonda Riley, Sara Slattery and Makiba Batten (Photo by Craig Macaluso). Word has spread. Back in 2012, 75 women attended the event. Now, that number topped 200.